Have you ever needed to upload multiple large files to your WordPress website or modify file permissions? By default, WordPress’ back-end doesn’t allow you to bulk upload media files or modify file permissions. However, File Transfer Protocol (FTP) enables WordPress site owners to access the web server directly to take care of these tasks and more. In this post, we’ll cover the basics of FTP and discuss why you might need to use it for your WordPress site. We’ll also recommend three of the best FTP clients for WordPress users. Finally, we’ll wrap up with a quick tutorial on how to get started with WordPress FTP. FTP is a network communication protocol that gives you direct access to a remote web server. You can use FTP to transfer files between your computer and the server, modify file and directory permissions on the server, download files from the server to your computer, and more. In a nutshell, FTP enables webmasters to manage files on a web server without having physical access to the server. FTP was developed in the 1970’s by an MIT student with the purpose of allowing files to be securely transferred between host servers and client computers. Since then, it’s undergone several revisions as the internet has evolved. FTPS and SFTP are secure alternatives to the original FTP specification which take modern-day internet security concerns into account. Over the course of 12 years, WordPress has grown tremendously into a complete content management solution. In fact, it is entirely possible to build and maintain a WordPress website without ever having to fire up an FTP client. You can create content, upload files, and even add custom CSS and PHP code to your website files right from the WordPress dashboard. At this point, isn’t it safe to say that WordPress users don’t need FTP at all? Well, no. As powerful as it is, the WordPress backend can’t handle everything. The best example of something WordPress can’t deal with on its own is the notorious White Screen of Death error which leaves you with no choice but to use an FTP client. Troubleshooting this issue and other like it is one of the major reasons why you can’t afford to dismiss FTP altogether. When your site takes a turn for the worst (which almost all do sooner or later) an FTP client will prove to be invaluable. Migrating your WordPress website to a new web server. Deleting or deactivating plugin and theme files which are causing compatibility issues. Modifying the wp-config.php file after migrating WordPress, changing your database prefix, or to turn debugging mode on or off. Adjusting file and directory permissions. Now that you know why you need FTP, let’s get you up to speed. FileZilla: FileZilla is a free, open source FTP client for Windows, Mac, and Linux. It features a drag-and-drop interface making it incredibly easy to use. If you’re starting out with FTP for the first time, we recommend going with FileZilla. Free FTP: Free FTP is available for Windows computers only. It comes with drag-and-drop functionality, one-click backups, and file tracking. Cyberduck. Cyberduck is a popular FTP client for Windows and Mac systems with a blazing fast FTP core. It enables users to integrate with cloud storage space and features bookmarking functionality to make file uploading more organized. Pick an FTP client and install it. For this tutorial, we’ll be using FileZilla and, for the sake of simplicity, recommend that you do the same. Next, we’ll show you how to set up and start using WordPress FTP. Before you fire up an FTP client and start tinkering with your website files it’s critically important to backup your WordPress website. Nothing we’re going to show you today should cause even a second of downtime, but it’s always better to play it safe. An address to access your web server. Typically you will either use a dedicated IP address or your website domain. Let’s start by figuring out your credentials. Most hosts will create FTP credentials for you when you sign up for hosting. If your host uses cPanel – and the vast majority of popular hosts do – then you already have FTP credentials. You can simply use your hosting account username and password as FTP credentials. However, if your host does not offer cPanel, then you may need to create an FTP account. You can create an FTP account by logging into your hosting control panel and navigating to the FTP section. Find the option to create or add a new account and select a username and password. When you create the account, make sure you provide access to the directory that contains your website. In most hosting configurations, you will need access to the directory called public_html. Next, you can set a value for Quota which limits the amount of data you can transfer or go with Unlimited to transfer files without any interruptions. Click Create FTP Account once you’re done. 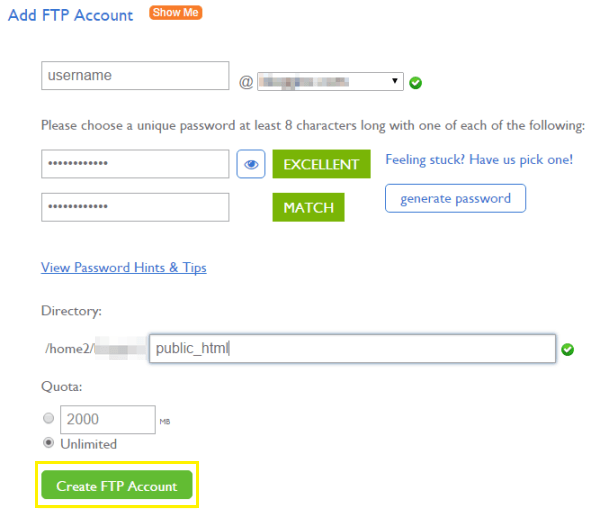 Adding an FTP account through cPanel. With your FTP credentials in hand, it’s time to locate your FTP host address. If your host uses cPanel, once again, things are thankfully easy. Just use the primary domain name associated with your account as your FTP host address. For example, if you signed up for http://www.yourawesomedomain.com when you created your hosting account, just use yourawesomedomain.com as your FTP host address. Another option is to use a dedicated IP address. Not all hosting accounts include a dedicated IP address, but if you do have one you can locate it by logging into your hosting account and navigating to the IPs section. Find your WordPress website’s IP address from your site’s cPanel. If all else fails, you may need to reach out to your host’s customer support department or do some research in their knowledge base to determine the appropriate FTP host address. Now that you know your FTP host address and credentials, it’s time to fire up FileZilla. Launch the FileZilla client, enter your FTP account details, and click the Quickconnect button to establish a connection. As you’ll see in the image below, we’re using a dedicated IP address, but enter your FTP host domain in the Host field if you don’t have a dedicated IP. Enter your FTP account’s login credentials to establish a connection. If your FTP connection is successful, you’ll see the Status updated to Directory listing of “/” successful. That’s all there is to it. You’ve established a connection between your hosting account and FTP client. FileZilla’s interface is divided into two sections: local site on the left and remote site on the right. Once you click on a folder on either side, the box below it will populate with the folder’s contents. FileZilla lets you transfer all kinds of files from any folder on your local computer to any directory on your web server. In order to start transferring files to your remote site from your computer, all you have to do is drag and drop them from the local site box to the remote site box. Select all the files you want to transfer and drag and drop them into the remote site box. These represent the file transfer states. Queued files: Queued files are those that you’ve selected to transfer and are in the process of transferring from your local computer to the remote web server. Failed transfers: These files are those that were selected to be transferred but were not successfully transferred to the remote server. Successful transfers: This tab displays a list of the files that were successfully transferred from your local computer to the server. If your files were successfully transferred then you’re good to go – the selected files are now uploaded to your WordPress website’s server. WordPress doesn’t recognize media files in the Media Library that were uploaded from anywhere other than the Media Library itself or via the Add Media button. This means that when you upload media files through the FTP client to your site’s Uploads folder then they won’t appear in the Media Library. Media files won’t show up in the Media Library. One way to work around this problem is to install the Add from Server plugin and register them from there. Another task that is commonly managed via FTP is changing file and directory permissions. To change file or directory permissions navigate to the directory or file you wish to manage, right-click to open the contextual menu, and select File permissions… from the bottom of the menu. Adjust permissions using the checkboxes or by entering a numeric value in the appropriate field. Click OK and the new permissions will take effect. One of the most common WordPress FTP tasks is to open and edit wp-config.php. To do this, first, locate the file. In a standard WordPress installation, you’ll find it in your website’s root directory. Use the local site section of FileZilla to locate your computer’s desktop, and then drag the wp-config.php file from the web server to your desktop. This will copy the file to your desktop. Before editing your file, create a second copy of it on your desktop with a slightly different name. Simply renaming the copied version x-wp-config.php will do. Now, open the properly-named version (wp-config.php) and edit it to your heart’s content. The last step in the process is to go back to FileZilla and drag the updated version of the file from your computer desktop back to the web server. When you do, FileZilla will ask you to verify that you want to overwrite the file on the server and provide several options. Select the Overwrite option and click OK.
Now, access your website to make sure that the intended change has taken effect. If something unexpected occurs, use the backup copy of wp-config.php on your desktop to restore your site’s original wp-config.php file. Transfer files to and from your web server with ease. Upload media files in bulk and then use Add From Server to import them into WordPress. Manage file and directory permissions. Edit WordPress files such as wp-config.php while troubleshooting WordPress issues. Do you have any questions about managing your WordPress site via FTP? Get in touch in the comments section below! I always find Filezilla easier in linux as compare to Windows. I’ve just started using DIVI WP (or should that be WP-DIVI) anyway I have been a self trained webmaster for 27 years. For MY personal websites. I’ve always used FTP to edit pages– I started out using Coffeecup and other small programs to build my websites. It’s funny my son who graduated from college laughs at my simple websites. He’s now a Computer Wireless guy for 10 years. I’ve tried to tell him that some people don’t want all their information on the website, just enough to get them into the store. ANYWAY — WP is a good program for some. Doing maintenance can take some time. I never charge my clients for editing a page. It took me 5 minutes to make the edit, so Coffeecup HTML is good that way. We need SIMPLE pages for Older people who don’t want to Look at pretty pictures on a website….. Can you make them in WP? Tony, there are plenty of websites dedicated to a currently popular trend – minimalism. You’re describing exactly what it encapsulates: function over style, with content as the focus. The good news is, you can definitely do this using WordPress and Elegant Themes’ products! Do you recommend using FTPS instead of FTP? SFTP at a minimum should be used. FTP is insecure. The speediest ftp clinet i know. Transmit is great. I use it too. The core concepts are useful to know, but I agree with Simon Harper, nobody should be using FTP. The reason is that FTP transfers user name and password (and everything else) unencrypted. With cPanel, this means you’re exposing your hosting account credentials to snooping or man-in-the-middle attacks. SFTP is the proper tool for the job. If your host doesn’t support SFTP, find a new host. Also, maybe just a typo, but your link to Free FTP “for Windows” goes to FireFTP, which is a cross-platform add-on for Firefox. How do we use SFTP through FileZilla? Thanks for the great insight on FTP. I don’t think FileZilla supports sftp! I use cyber duck on osx. When setting up a connection, just choose SFTP instead of FTP. If you’re using Quickconnect, enter 22 in the Port field. Comments elsewhere online indicate that both FileZilla and CyberDuck are usually bundled with malware during download and installation, so, not being at all savvy about how to deal with that I wonder if anyone could verify a good experience with these downloads. I have Mac El Capitan. If you use the link in the article above, you will be getting if from the proper source. Yes, Robert is correct. You should always download your software directly from source. We will only include direct links to tools and services, too. Thanks! I did some reading on this and learned that there are two different ways to do secure FTP: FTPS (FTP over SSL) and SFTP (SSH File Transfer Protocol). I was going to stick with FTPS since it’s easier to implement. Unlike SFTP, I don’t have to generate a SSH key pair, etc. You don’t have to generate a key pair to use SFTP, unless your host forces you to do so. When I was working at a client’s mac, they use cyber duck for ftp. One great feature I stumbled upon was the ability to load the php file directly off cyber duck then edit the file in Text Wrangler. Once I save the file (not on my local comp) it uploads the updated the file back to the server. Can someone recommend me a similar program setup for windows? you can setup sftp or ftps. It will upload the download and update the file back to the server. FileZilla does that too. I have Microsoft Visual Studio Code (freeware) set as my code editor and I can right-click any file (.php, .xml) inside FileZilla, choose View/Edit and it will open in VSC. After editing, I save the file and once I go back to FileZilla, it’ll ask if I want to upload the saved file. You can use any program to be your default editor with Filezilla (notepad++, notepad, UltraEdit or Microsoft Visual Studio Code etc). After you perform changes you will be ask by FileZilla if you will like to upload the file to server. We all have more than one editor to accomplish our daily tasks, Lightweight editors like editplus, notepad++ have a small footprint and comes in handy, you can open the files directly without using FileZilla or other ftp solution to invoke the editor. Use what makes your job easier and fast. Cliff. That’s one of the reason I like Cyberduck. And I use it on WIndows. For the most common WordPress FTP tasks to edit wp-config.php or other text files I use editplus by configuring the remote access, it allows to setup ftps or sftp. Thanks for the suggestion, Alejandro! I still find FTP relatively awkward to work with if you want to edit files directly using Sublime Text or Brackets. I now use WebDAV for file access and find it a smoother way to work directly with files. Most hosting with cPanel can offer ‘Web disk’ (cPanels’s name for WebDAV access) although the hosting company may need to make some setting changes for it to work. I no longer use FTP, but Cliff, Cyber Duck is available for Windows and works well (I prefer it to FileZilla). Great explaination for the importance of ftp for wordpress users like me .I think FileZilla is the best one cause it’s free and simple to use. Thx for this one, very comprehensive.